FHA Loan Credit Scores: How Low Is Too Low? First-time home buyers often wonder how low their credit scores can be and still get FHA home loan approval. The FHA Single Family Loan Handbook states that borrowers with FICO scores below 500 are not eligible for FHA mortgages. January 24, 2019 - First-time home buyers often wonder how low their credit scores can be and still get FHA home loan approval. Do you know how low is too low when it comes to credit score requirements for home loan approval? The FHA Single Family Loan Handbook, HUD 4000.1, states that borrowers with FICO scores below 500 are not eligible for FHA mortgages. Home loan approval is technically possible under the FHA mortgage loan program for first time buyers with FICO scores between 500-579, but there will be a higher down payment required. 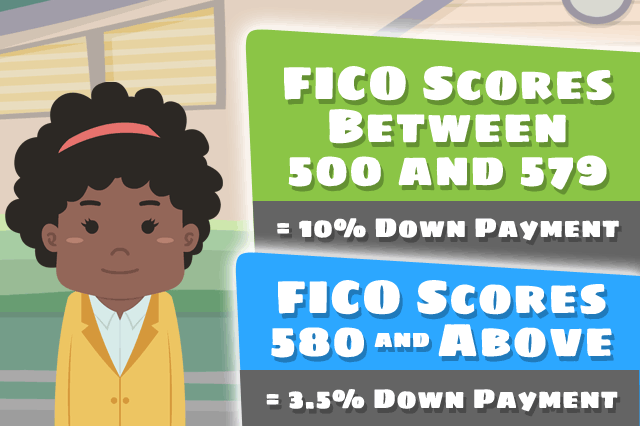 Borrowers with FICO scores in this range will be required to make a 10% down payment instead of the much lower 3.5% down payment for FHA loan applicants with FICO scores at 580 or higher. The FHA minimums mentioned above are not always the same as the lender’s minimums. Do not be surprised to discuss your FHA loan needs with a lender who requires credit scores in the 600 range for maximum financing. Lenders may require higher FICO scores depending on the type of loan, the lender’s standards, state law or other variables. The FHA loan FICO score minimums discussed here are not necessarily tied to the lender’s FICO score rules. But remember, FICO scores are not the only criteria with which the lender will approve or deny the loan. Your credit score may be lower as a new house hunter if you don’t have a long credit history. Your lender will take this into account and review your payment history and other factors to determine your actual creditworthiness, rather than take the simple FICO score numbers and decide based on them alone. If you have a dependable payment history (12 months or more of on-time payments for all financial responsibilities) your FICO scores may be offset by this and/or compensating factors which your lender can explain to you based on that financial institution’s guidelines. While the concept of a bad credit FHA home loan doesn’t really fit in with what we’ve described here, it’s important never to assume you are not qualified for a home loan without discussing your specific circumstances with a lender; you may be surprised to learn how willing a financial institution is to work with you if your FICO scores are lower but you have other factors working in your favor.